As the Trump saga unfolds, the mainstream media finally mentions “the deep state”. From Bangladesh, underground researcher and host of alternative radio’s “Unwelcome Guests”, Robin Upton. Then Dr. David Carlson, the Director of the World Climate Research Programme explains how unpredictable our future has become. The term “Deep State” used to be kept carefully out of bounds for the mainstream media. Now with the machinations of the Trump regime, the leaks and the Russians – the deep state is part of open talk. But what is it? Robin Upton has been documenting the deep state for a long time. Robin is a mathematician, a radio/podcast host, and a researcher’s researcher. He was raised in the United Kingdom and Denmark, but since 1998, Robin Upton has picked a new home: Bangladesh. Robin Upton took over the radio show “Unwelcome Guests” from long-time host Lynn Gary. Robin kept it going another 10 years – from his adopted country of Bangladesh! He tells us about the Deep State, but also an alternative economy, based not on greed, but on altruism. We also talk about misconceptions about life in Bangladesh (no – he’s not hungry or flooded out). You can find a listing of the many radio programs Robin has done about the Deep State here. If you would like to see what Robin looks like, here on You tube is a half hour video presentation he did in 2011 called “A Brief History of Plutocracy”. Robin adds: “With possible censorship in mind, and the falling price of bandwidth, I created the 100 shows at a time ZIP files.” That means you can grab 100 shows at a time, for listening later. Check it out here. There is also this previous interview about Robin and how he got involved with Unwelcome Guests, from February 2012. Anyone can see signs of climate change. Ice is retreating. Each year is the new hottest record. The weather seems unstable. Plus we have a constant stream of new science from all over the world confirming it. If the situation is becoming clearer, why are some scientists still cautious? We’ll find out with our next guest, a veteran organizer of scientific research. In 2007, Dr. David Carlson helped put together the International Polar Year. He has directed explorations into the ways oceans and the atmosphere interact. David led the Atmospheric Technology branch of the US National Center for Atmospheric Research or NCAR. 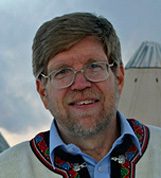 Now Carlson is the Director of the World Climate Research Programme or WCRP. Their web site is here, and the WIKI entry here. Carlson says that even as we find out more about climate and the bio-physical world – things are not all turning out as expected. In one big example, scientists used to be able to study and predict the El Nino/La Nina cycle. Now that has been destabilized, along with many other aspects of both climate and weather prediction. DO WE NEED MORE CLIMATE SCIENCE? One of Canada’s brightest climate scientists is Dr. Andrew Weaver from the University of Victoria. Except he quit, to become the first Green Member of Parliament in British Columbia. On Radio Ecoshock, Andrew Weaver questioned whether we need any more climate science. We know more than enough, he said, to know we are in deep trouble. It’s time for action. I ask David Carlson if he thinks we need more research, and what are the priority targets? I am a bit nervous that the public is trying to nail down a fixed image of climate change. For example, we have three record hot years in a row, likely with Pacific ocean temperatures as a driver. But what happens if we have three really cold years? Is that still possible? Carlson says that it is. Again, the larger patterns that led us to think we could predict climate change have themselves become destabilized. That tells me we are in for a bumpy road with surprises. CRAZY WEATHER: IS IT THE TROPICS OR THE ARCTIC? When I was gathering climate news and reports in the 1990’s, the rule was simple: the tropics determine weather in the mid-latitudes, where many of my listeners live. Since 2007, there are suggestions the main influence in the Northern Hemisphere has become a changed Arctic. Dr. Jennifer Francis of Rutgers has been our guest twice. Her observation is the melt-back of the Arctic sea-ice, and lower snow-cover on land, has co-incided with a Jet Stream that is slower and bent. That can shape significant weather events. Earlier in his career Dr. Carlson was the Director of something called the Tropical Ocean Global Atmosphere Coupled Ocean Atmosphere Response Experiment, (TOGA COARE). So I was interested to get David’s views on the on-going discussion in science: is the weather experienced by most of our listeners more determined by the tropics or the changing Arctic? A recent guest has published a paper saying current bio-physical climate models fail to include enough influence from humans, and this civilization. That is Safa Motesharrei from the University of Maryland. (You can listen to or download that interview here.) He told us things like population and consumption can radically change the environment we are trying to model – but the biggest climate models have no dynamic inputs for the economy. I ask David is that it fair, and can we include human drivers in the systems we study? A week ago, friends in the East complained they were out in shirt-sleeves in the afternoon, and snowed into a deep-freeze later that same day. That’s not new in March, but after getting summer weather in December, and hail in July, the public has begun to distrust the weather. Is this a misunderstanding or misuse of climate science? In an email, David Carlson wrote to me” “Ecosystems, prior to collapse, very often show clear signs of unpredictability.” In this interview he explains, and gives us an example. Considering his newest paper is about unpredictability of climate, that’s an ominous sign, in my opinion. If we want to search for meta-patterns, how do we do it? Does it take massive computing power and artificial intelligence? Or is it still a few scientists pouring over data in their brains? Maybe we won’t be able to continue funding the science of the big picture, without giving politicians climate examples they can use today. Isn’t it hard to say “we don’t know, we need to find out” when people seem desperate for answers now? THANK YOU FOR LISTENING – AND SUPPORTING THE WORK OF RADIO ECOSHOCK. We are out of time again. Thank you for listening, and please join me again next week for more Radio Ecoshock. The credit for this week’s graphic image goes to Matt Taylor, in a comic book titled “Deep State”, published by Justin Jordan in 2014.